A while ago we onboarded an exciting package, codemetar by Carl Boettiger. codemetar is an R specific information collector and parser for the CodeMeta project. In particular, codemetar can digest metadata about an R package in order to fill the terms recognized by CodeMeta. This means extracting information from DESCRIPTION but also from e.g. continuous integration badges in the README! In this note, we’ll take advantage of codemetar::extract_badges function to explore the diversity of badges worn by the READMEs of CRAN packages. “review”, information about review of the software if there was one. codemetar recognizes information from the peer-review badge we add to the README of onboarded packages thanks to work by Karthik Ram. conversion to XML using commonmark (see my recent tech note) which works well for the Markdown badges e.g. [! [Travis-CI Build Status](https://travis-ci.org/ropensci/codemetar.svg?branch=master)](https://travis-ci.org/ropensci/codemetar). extraction and parsing on the first HTML table there is if there’s any, which is necessary for badges in table, which we’ve been discussing for our guidelines. Quite handy for our metadata collection! Read the source for extract_badges here and see how it’s used in this script. You can also compare codemetar’s README with its codemeta.json e.g. the lines for “contIntegration”. Now since, codemetar::extract_badges exports a nice data.frame for any README with badges, and is exported, it’d be too bad not to use it to gain insights from many, many READMEs! In this exploration we shall concentrate on CRAN packages that indicate a GitHub repo link under the URL field of DESCRIPTION. By the way, if you don’t indicate such links in DESCRIPTION of your package yet, you can (and should) run usethis::use_github_links. I reckon that I could have also used BugReports like Steven M Mortimer did in his great analysis of CRAN downloads and GitHub stars. I am unsure of how one can get the link to and the content of the README of packages that don’t Rbuildignore their README, such as codemetar (see under Material). The imperfect sample I collected will do for this note. github_cran$repo[which(github_cran$Package == "webp")] <- "webp"
I needed a bit of string cleaning mostly to deal with the URLs of Jeroen Ooms’ packages, see e.g. this one. I guess I could have cleaned even more, but it was good enough for this exploration. Then for each repo I queried the download URL of the preferred README via GitHub’s V3 API, using the gh package. The preferred README is the one GitHub displays on the repo landing page. I used codemetar::extract_badges, of course. I rate-limited the basic function using ratelimitr. I first had a look at the most common domains. For the 17 most common of them, I accepted the images except for one, ropensci.org, included because the footer our packages get is formatted as a Markdown badge. For the remaining images, a bit more than 200, I used magick to obtain their width and height, and filtered actual badges based on their width/height ratio. Sometimes the link to the image wasn’t even valid, which was also a reason for exclusion, since it revealed the image was a local one. # it'd have been wiser to use a row-wise workflow! Don’t judge me by my filenaming skills. I was maybe a bit too enthusiastic! I wanted to answer several questions about the badges of CRAN packages, beyond being just happy to have been able to collect so many of them. 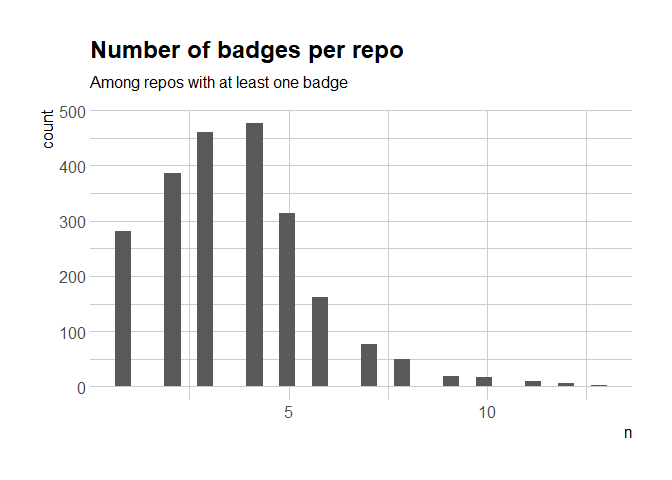 How many repos have at least one badge? # the same repo can have been used by several packages! There are 1277 packages without any badge (or rather said, without any badge that we identified) out of a sample of 3541 packages. That means 64% have at least one badge. As a reminder, there are more than 13,000 packages on CRAN so we’re only looking at a subset. Among the repos with badges, how many badges? The median number of badges is 4, which corresponds to my gut feeling that the answer would be “a few”. I have a new question, what are the repos with the most badges? You can browse them at https://github.com/cdeterman/gpuR, https://github.com/neuropsychology/psycho.R. How many unique badges are there? For counting types of badges, I’ll use the domain of image_link. This is an approximation, since e.g. www.r-pkg.org offers several badges. Not that many after all, so I’ll print all of them! A special mention to https://github.com/ropensci/cchecksapi#badges maintained under our GitHub organization by Scott Chamberlain, to show the CRAN check status of your package! Unique badge domains collapsed by glue::glue_collapse(unique_domains, sep = ", ", last = " and "): anaconda.org, api.codacy.com, api.travis-ci.org, app.wercker.com, assets.bcdevexchange.org, awesome.re, badge.fury.io, badges.frapsoft.com, badges.gitter.im, badges.herokuapp.com, badges.ropensci.org, bestpractices.coreinfrastructure.org, ci.appveyor.com, circleci.com, codeclimate.com, codecov.io, coveralls.io, cranchecks.info, cranlogs.r-pkg.org, depsy.org, dmlc.github.io, eddelbuettel.github.io, githubbadges.com, githubbadges.herokuapp.com, gitlab.com, hits.dwyl.io, i.imgur.com, img.shields.io, jhudatascience.org, joss.theoj.org, mybinder.org, popmodels.cancercontrol.cancer.gov, pro-pulsar-193905.appspot.com, raw.githubusercontent.com, readthedocs.org, saucelabs.com, semaphoreci.com, travis-ci.com, travis-ci.org, user-images.githubusercontent.com, usgs-r.github.io, www.nceas.ucsb.edu, www.ohloh.net, www.openhub.net, www.paypal.com, www.r-pkg.org, www.rdocumentation.org, www.repostatus.org, www.rpackages.io and zenodo.org. What are the most common badges? Note that this doesn’t take into account the fact that one domain can appear several times in a single README (Travis status for different branches for instance). The most common badges are Travis-CI badges, and METACRAN badges from www.r-pkg.org and cranlogs.r-pkg.org. Now, “img.shields.io” is a service for badges of other things… which? Diverse things, in particular the Tidyverse lifecycle badges. After some discussion, we at rOpenSci have adopted the repostatus.org status badges in our guidelines… but are actually open to repos using both types of badges since their nomenclature can complement each other! In this tech note I presented and used one of codemetar’s tools for R package metadata munging, extract_badges. I extracted and analyzed badges information from the READMEs of all CRAN packages that indicate a GitHub repo in the URL field of DESCRIPTION. README badges are a way to show development status, test results, code coverage, peer-review merit, etc. ; but can also be used as a machine-readable source of information about these same things. Explore more of codemetar in its GitHub repo, and check out the CodeMeta project itself. Read our guidelines for package development and maintenance in this gitbook. And have fun adding pretty badges to your own package repos upping your package development & maintenance game! If you’re new to continuous integration I’d recommend reading this great post of Julia Silge’s, and this chapter of our guide for package development. Memoizing a function means that when called again during the same R session with the same parameters, a cached answer is used. See the vignette of the memoise package.